Campari is one of my favorite ingredients, but lately I have been seeing a lot of cocktails made with Gran Classico. Even some bartenders saying they prefer it to Campari. I have enjoyed Gran Classico mixed in cocktails out, but have never tried it on its own. The obvious question burned: could this actually be better than Campari? I had been staring at that bottle of Gran Classico for quite some time, months actually. I would almost buy it, then change my mind, always hesitant because of the slightly higher price. I would have thoughts such as why would I pay more for something that supposedly tastes a lot like Campari? Or what if I were to like it more than Campari? I blow through Campari like nobodies business and would thus be spending more money to make my drinks with Gran Classico. Finally, I broke down and bought a bottle. Excited to try it, I rushed home, opened the bottle and poured some for myself. Eager for a taste, I raised the glass to my lips and took a swig. WOW! This stuff is really good. . . just one problem, it tastes almost nothing like my beloved Campari. I can see why people might compare the two, as superficially they both have bitter aspects and orange flavor, but then so do a lot of other spirits. So I took a step back and thought, why not do a more in depth comparison of the two. I did a few tastings, even tried comparing them in cocktails. I slowly began writing things up. Then one day my wife came home with a bottle of Luxardo Bitter, and suggested that I obviously needed to add it to my comparison, since they are the three “main” bitter orange spirits we hear about most often. So it was back to tasting them all over again. . .it’s a tough life sometimes. What follows are my notes and observations on Campari, Gran Classico and Luxardo Bitter followed by a few Recommendations. Disclaimer: As anyone who has frequented The Straight Up knows, I am a huge fan of Campari and thus realize I am going into this with a little bit of bias. That being said, I am also love bitter spirits in general (also obvious from the site) so have tried to keep an open mind about the whole process. Campari – bitter orange, hints of gentian and quinine, light, effervescent. Gran Classico – orange and rhubarb upfront, gentian, lightly bitter aroma, sweeter, heavier. Luxardo Bitter – very similar to Campari, a stronger aroma but yet smells like it would taste lighter than both. Gran Classico – orange and rhubarb again, more complex and “thicker” on the palate, stronger notes of gentian, mildly bitter, less so than Campari, sweeter than Campari. Campari – herbal and rooty with a long an lingering bitter quinine laced finish that expands through your mouth. Luxardo Bitter – herbal and slightly more bitter than Gran Classico, but with a similar finish to Gran Classico. Lacks the prolonged bitter finish of Campari. Overall, Gran Classico has a heavier nose and taste throughout. The body is more like a typical amaro, such as Amaro CioCiaro, or Amaro Nonino, both of which have orange accents. The Campari is much lighter in feel, although it has a much more Potent bitter flavor and contrast from the begining to the end of the palate, more so than anything I’ve tasted. Campari comes on sweeter, then ends dramatically more bitter, while Gran Classico is slightly more bitter upfront, continuing throughout, but being less noticeable in the mid palate as the sweetness kicks in. While I find both enjoyable, depending on my mood, some folks may prefer the contrast in the Campari, while others the more Familiar progression of the Gran Classico. Sweetness – definitely Gran Classico, far sweeter than Campari. Bitterness – hands down Campari. Much more bitter than Gran Classico. You may have noticed I haven’t mentioned Luxardo Bitter yet. That is because in nearly all aspects it fits more in-between Campari and Gran Classico. It is a less bitter, heavier and sweeter than Campari, but not as much as Gran Classico. Luxardo Bitter also has some rhubarb accents, but overall is less complex than Gran Classico. As expected, the traditional Boulevardier with Campari is drier and more bitter than the Gran Classico version, with an almost smokey flavor. The heavier and sweeter Gran Classico pairs nicely with whiskey and makes for a great cocktail. But like the look, the two are quite different cocktails. Tip: Try a Gran Classico Boulevardier with Rye to tone down the sweetness a bit. The traditional Boulevardier is mildly sweet from the bourbon and vermouth, but the bitterness and stronger orange brought by the Campari make the drink (otherwise it would just be a Manhattan). In contrast, the Boulevardier with gran classico is very different and in my mind not a Boulevardier at all; not that this is a bad thing. The taste is a bit heavier and sweeter, almost such that you would think cognac is present. More like a cross between a Boulevardier and a Vieux Carre. The Luxardo Bitter version again comes in-between, but lacks the dynamics at either end (potent bitter vs. sweet complexity), making for a good middle of the road flavor. Here’s the deal though. I love the Boulevardier in any form. I also love Vieux Carres and everything in between (and beyond). I keep coming back to this, but it is a bit of an oversimplification to compare Campari and Gran Classico as if they were two versions of the same thing. This is not bourbon A vs bourbon B. These are two different spirits, both of which happen to have bitter and orange elements. 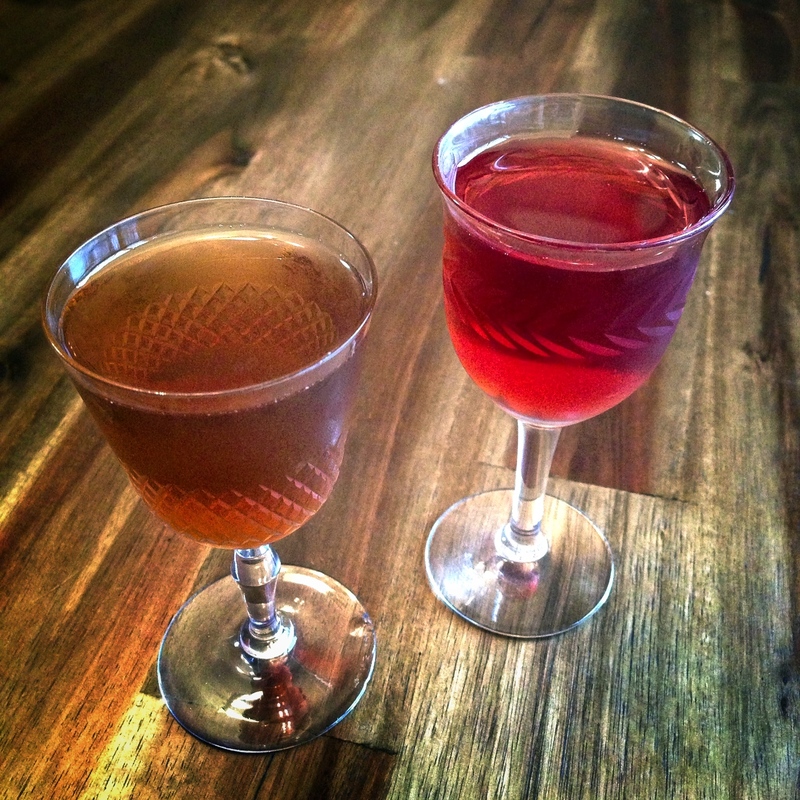 Sure you could easily substitute one for another in a cocktail, just as you could substitute Fernet-Branca in place of Amaro Averna, but the resulting drinks would taste significantly different. This comparison falls apart a little with the Luxardo Bitter, which manages to straddle the middle. Not too bitter, not to sweet, or too heavy or too light. Heck even the proof is between Campari and Gran Classico. Mini Negroni’s – Can you guess which one is which? This is a tough question, and I am admittedly biased, but in the end nothing beats Campari for me. There is something magical in that brilliant contrast between the sweeter orange front end and the long bitter finish. Nothing else I’ve ever tasted has had a finish quite so powerful. I love it in cocktails as well as on its own and to me it’s the best value for the money. This being said, I am sure those who like something a little sweeter and less bitter may prefer Gran Classico to Campari. That is not to say that I don’t absolutely love Gran Classico; in fact I’ve drained more of the bottle than I care to admit. Gran Classico also doesn’t have as fair a shot. I’ve been drinking Boulevardiers and Negroni’s with Campari for some time (they are two of my favorite cocktails). It’s been instilled in me that they should taste a certain way. It’s hard to change that. . . although I’m not sure I’d ever want to. Luxardo Bitter is also a great product which will definitely appeal to those looking for something a bit bitter, without going to the extremes of Campari. It would also make a great stepping stone to the bitterness of Campari or the sweeter complexity of Gran Classico. Unfortunately, by straddling the middle of the road, it got lost a bit to me among the more distinct flavors of Campari and Gran Classico. Spirits such as Amaro Nonino, Amaro CioCiaro and Calisaya, among others overlap a bit with these as well. I prefer to look at GRAN CLASSICO and LUXARDO BITTER as different ingredients in the realm of bitter orange flavors. Like Amaro is a broad category for bitter spirits, these all fit under a broad category. Just like I wouldn’t just use Fernet-Branca for all drinks that call for an Amaro and say forget about Averna, one is not necessarily a be all end all substitute for another and they all have their place. A Boulevardier with rye is called a 1794. I like to use these in new creations or twists on classics that allow them to shine on their own without the stigma of being Campari wannabes. Although they are great swapped in for Campari, to my tastes if using, require a bit of retooling of the ingredients to make a more balanced cocktail. For example, I particularly like making a Rye/Gran Classico version of the Boulevardier as the spicier rye tones down the sweetness a bit. Look for some of these soon on The Straight Up. Looking to do things the classic way? Then Campari is the way to go, hands down, provided you like its bitter taste, which doesn’t appeal to everyone at first. Even I at first was not a huge fan of Campari as it was far too bitter for me. But now I crave that flavor and can’t imagine not having it as a staple in my cabinet. Like amari and looking for something new? Gran Classico will be an excellent addition to your collection. It will also give you some variety when substituted into variations of classics as well as used in new cocktails, not to mention Gran Classico also tastes great neat. Just getting into bitter spirits/amari? Luxardo Bitter has a great flavor that is not quite as bitter as Campari nor as sweet as Gran Classico. I think it makes a great introduction to this type of spirit and has a middle of the road taste that will please a broad audience. That being said if you are a fan of Campari and Gran Classico it may get lost a bit in the shuffle. In the end, you can’t go wrong with any of these, they are all great products. It really depends on what you are looking for and where you fall on the bitter scale. I AM loyal to Campari but can’t drink it neat. I’m wondering about Gran Classico as a digestif? Neat? I asked about it at my local VA ABC store and got a look of bovine incomprehension. I will just have to wait for you before I try it. Gran Classico is also great neat. It is less bitter than Campari but is also much sweeter than most spirits I would consider a digestif, but that’s just my opinion. I much prefer Fernet-Branca or Cynar as digestifs, with Cynar being the more approachable of the two. Gran Classico is harder to find and has more variations in price. The cheapest I’ve seen it is near me in DC for about 32 bucks. I was shocked when I first tasted Gran Classico, everything I read and heard compared it to Campari “w/out the red dye.” Gran Classico to me tasted more like a digestive, Amaro Lucano or Montenegro, lighter then Averna , less sweet but still orange peel and spicy. The great thing about Campari it lacks the saccharin sugary component in the taste. Gran Classico is too sweet for my liking . Luxard Bitter compares better to Aperol. Both very similar in levels of bitterness, color and probably alcohol content too. I agree. Nothing beats Campari for me. I find the others to be too sweet as well. I do like them worked into drinks though.